Mr. Mulligan has been studying Martial Arts for over 20 years. As a child, he was enrolled in ITF style Tae Kwon-Do in Oakville, ON. 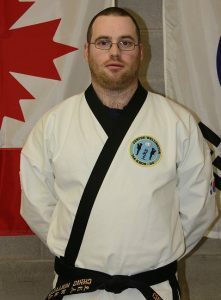 After moving to the Centre Wellington Area in August of 1993, Mr. Mulligan joined the Fergus Branch of Chung Oh’s School of Tae Kwon Do. After a few years of training & competition he left to pursue other interests. Years Later in 2006, Mr. Mulligan re-joined Chung Oh’s School and became an Assistant Instructor the following year. In 2007 & 2008, Mr. Mulligan was honored by being named Canadian Tae Kwon Moo Do Federations Champion of the Year. In 2009, Mr. Mulligan had the opportunity to travel to South Korea with GrandMaster Chung W. Oh for a cultural exchange and training tour. Although the trip was a short one, he was able to learn quite a bit of information & looks forward to traveling to Korea again in the future. Over the years that Mr. Mulligan has had the opportunity to learn from many incredible teachers incl. Grandmaster Chung W. Oh, Grandmaster Inn Oh, Grandmaster T. Oh & more. Currently Mr. Mulligan continues to study Traditional Tae Kwon-Do under the Guidance of Senior Grandmaster T. Oh, one of Grandmaster Chung W. Oh’s sons. In addition to studying Tae Kwon-Do, Mr. Mulligan has spent some time training in Shotokan Karate, Hapkido, Gumdo & other Korean weapons and currently he is also a student of Combat Hapkido. Currently Mr. Mulligan & his family reside in Fergus, Ontario and when not teaching, training or working he enjoys spending time with his Family & Friends, and spending time outdoors (fishing, hunting, snowmobiling, camping, hiking, etc. ).